Never before have you owned a LINER like it! illustrating, graphic design and documentation. xylene free and conforms to safety standards of ASTM D4236. ShinHan TOUCH LINERS are available in 9 different nib sizes (in Black color only). 7 different colors (Red, Orange, Yellow, Green, Blue, Purple, Brown) are also available in 2 different nib sizes (0.1mm and Brush). Chisel and Brush nibs can be used in a wide range of art and design fields as they give works a proper and vivid sense of touch. 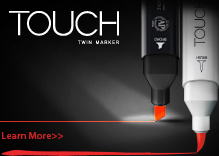 They are most ideal for working with TOUCH TWIN markers because they won't bleed or smear when used together. ShinHan TOUCH LINER is AP certified, evaluated by the ACMI, and Arts and Creative Materials Institute.